I love Gulch. There, I said it. It was not love at first sight. It’s the kind of love gained through time and respect. I am an Old Friends volunteer tour guide – by the way – best job ever. On paper alone, Gulch is beyond impressive. These are the statistics: Won over 3 million dollars on the track. Eclipse award winner. Winner of 10 graded stakes. Breeders’ Cup winner. 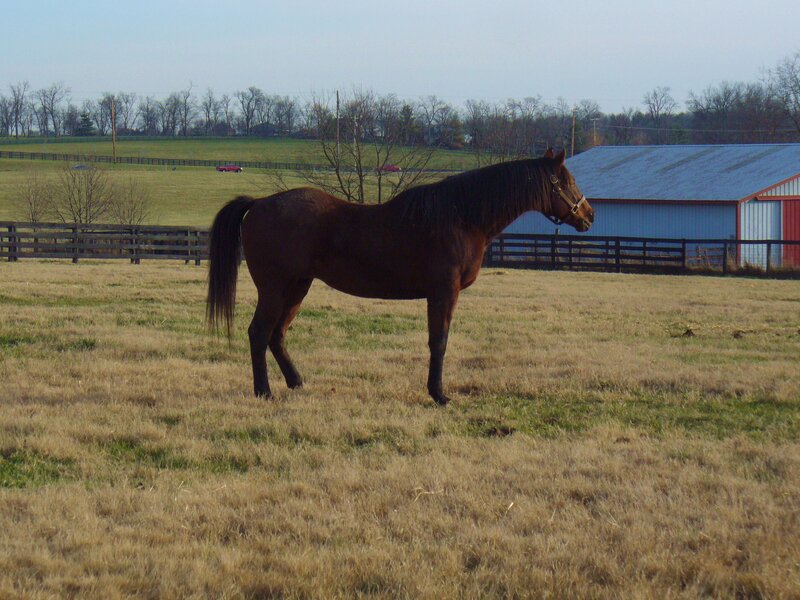 Sire of Kentucky Derby winner Thunder Gulch. Progeny earnings of over 97 million dollars. Queen Elizabeth’s favorite thoroughbred. Yes, that Queen Elizabeth. But statistics are not the measure of “my Gulch.” The great horses have an aura about them. I am not quite sure what comes first, the aura or the achievements. It is most probably a little bit of both. He has that aura. I just love everything about him. I love his “toughness.” I love his “intelligence.” I love his sense of who and what he is. False modesty is just not in Gulch’s DNA. I love his lack of regard for foolishness. I love “the package.” Small but mighty. I, selfishly, love standing in the presence of greatness. He is the ultimate little engine that could. There, I said it. I LOVE Gulch. The horses are well. They seem mighty pleased with the spell of cooler weather we’ve been having. In fact, so far Kentucky has had a beautiful June for horses, mostly temperate with alternating sunshine and rain for good grass. Clever Allemont, who’s 31 now, goes in the barn if the day gets hot. When he comes out for the evening he’s ready for his “gossip with the guys,” his current neighbors, Sunshine Forever and Sean Avery. I don’t know what our stallions communicate to each other when they hang out peacefully across the fences from each other, often for hours. Maybe they’re just silently enjoying their companionship. Stallions don’t share paddocks, of course. Stallions are territorial and would fight if one trespassed into another’s space (Gulch isn’t even fond of humans resting their elbows on his fence), but with each the master of his own territory and secure in the knowledge that the fences keep it that way, our stallions are as social in their way as the geldings or mares. Just watch them when a new resident arrives. When the van comes up the drive and they scent an unfamiliar horse, they signal the intruder alert. They’re as protective as a herd. In fact, watching the ones with paddocks on the edges of the farm keep an eye on the world beyond, while those whose paddocks are in the farm’s interior graze unconcernedly, it’s clear they do consider themselves a herd. Ogygian, Gulch, Creator and Williamstown are especially serious about their responsibilities as herd guards. Not long ago some sirens made a racket along Paynes Depot Road, not that common a sound in the country. Bull Inthe Heather, Sarava and Mixed Pleasure galloped to whichever corner of their paddocks was farthest from the commotion. Ogygian trotted toward the unknown. Standing where his fence makes one of the farm’s boundaries, he arched his neck, making himself as scary as he could. He kept a fierce, one-eyed watch in the direction of the siren-monsters until he was sure they’d gone and posed no more threat to the herd. Ogygian loves his paddock where he’s lived for nearly 7 years. I think its perimeter position is one reason why. And if the sirens really had been monsters, who would you rather have guarding you? Michael’s blog entry for last week recounted a remarkable Belmont weekend. This Saturday a few of us got to bask in some reflected glory when Charlie Pigg arrived to show us the blanket of carnations worn in the Belmont Stakes winner’s circle by Palace Malice. Charlie, one of Old Friends’ most valued supporters, is a partner in the 2013 Belmont winner, who races in the colors of Dogwood Stable. He spread the carnation blanket, a little wilted but still awesome, on one of the picnic tables by the barn and let us oooh, ahhh and gently touch it. Palace Malice, a 3 year old colt, has many thrilling races and big wins ahead of him, we hope, and after that, a long, successful stud career, but Charlie told us that some day, when it’s time for Palace Malice to retire, he hopes his partners will agree with him that Old Friends should be his retirement home. We hope so, too! Meanwhile, it sounds as if an exciting summer campaign is mapped out for Palace Malice. We wish him success! So, if you visit the Kentucky farm this summer and decide to rest with some cool water at one of our picnic tables in the shade, remember that you may be sitting at a table that was draped with Palace Malice’s 2013 Belmont blanket! Coming soon: unsung equine heroes of the track. Sometimes things just work out. A few years back, with the support of Dogwood Stable and Cot Campbell and old friend, Charlie Pigg, Old Friends was able to bring Wallenda home after his stallion career was over in Japan. The Flying Wallendas, decked out in the Dogwood silks, even came to the farm to perform their spectacular high wire act. A few months ago, Frank Alexander (Wallenda’s trainer) and his wife, Linda (who knew more about our horses than I did) visited Wallenda. All of these events led to me sitting in a bar a few nights before the Belmont Stakes with Charlie Pigg, Golden Soul’s trainer Dallas Stewart, HRTV’s Laffit Pincay III and Hall of Fame jockey and Oxbow’s rider, Gary Stevens. I was passing out the new edition of the Old Friends magazine. The bar featured cocktails named after all the Belmont entries. A few days earlier, three of the five stakes races run at Belmont were named after our retirees, Dancin’ Renee, Affirmed Success and Commentator. Previous owners Sanford Bacon, Al Fried and Tracy and Carol Farmer all came back to Belmont to hand out the trophies for their respective horses. There were many, many racing fans that came by the Old Friends table to get a magazine and share stories of their relationships with so many of our horses. Trainer Phil Serpe, who campaigned Klassy Briefcase when she broke the world record for five furlongs on the grass, promised to donate the halter she wore on that amazing day to our permanent collection. On the Wed. before the Belmont, we held our second event at Oheka Castle where we presented the 2013 Frankel Award to Daily Racing Form. Mandy Minger, Jeff Birch, Tom Peyser and, of course, Barbara Livingston were all present to accept the Frankel on DRF’s behalf. The award itself is a stunning bronze created by Phoenix-based artist, Fred Krakowiak named for Bobby Frankel and inspired by Frankel, the racehorse. The evening was a great tribute to everyone connected with Thoroughbred retirement but especially, 2012 Belmont winner Sarava. Owners Gary and Kitty Drake attended along with jockey Edgar Prado. Special thanks to artist Leland Neff, who attended and donated his painting of Rachel Alexandra (which was purchased by Gary Drake for $5000) and all the farms that donated halters from past Belmont Stakes winners. On Belmont Day, while I watched the race from the grandstand at Saratoga Raceway, Palace Malice confidently strode home the victor. All the Dogwood people were there. Charlie Pigg stood proudly behind Cot Campbell during the trophy presentation. It was a great day for Palace Malice and for Charlie. As I left the bar that night, I stopped in the hotel gift shop. It’s run by a very nice man from New Delhi. I gave him a couple of magazines. He asked me if I knew Mr. Smith, the jockey on Palace Malice. I told him we were acquaintances and Mike liked Old Friends. “I don’t know much about it,” he said. “But Mr. Smith told me I should bet all my rupees on his horse.” I don’t know whether he did or not but all the winning tickets in the world couldn’t have made our friend Charlie Pigg any happier. Saturday was a good day at the farm. The cooler, softer weather was enjoyed by visitors who included racing folks, other horse people and a lot of very nice people just enjoying being in Kentucky on an early summer day. The horses are dappling out from the sun and the vitamins they’ve been getting from their yummy grass and their Triple Crown Senior Feed (even I think this smells yummy—its good beet pulp smells sort of like date bread). All goes well at Dream Chase Farm. Sometimes uneventful is good. And it leaves time for reflection. I’m a pedigree geek. Every once in awhile as I watch the OF residents graze and think about the outstanding careers some of them had, I remember some equally magnificent, even older friends who came before them and whose proud heritage they carry. Today I’m thinking of Roberto (1969-1988), who passed along his gutsy ability on the grass to some of our most famous residents. 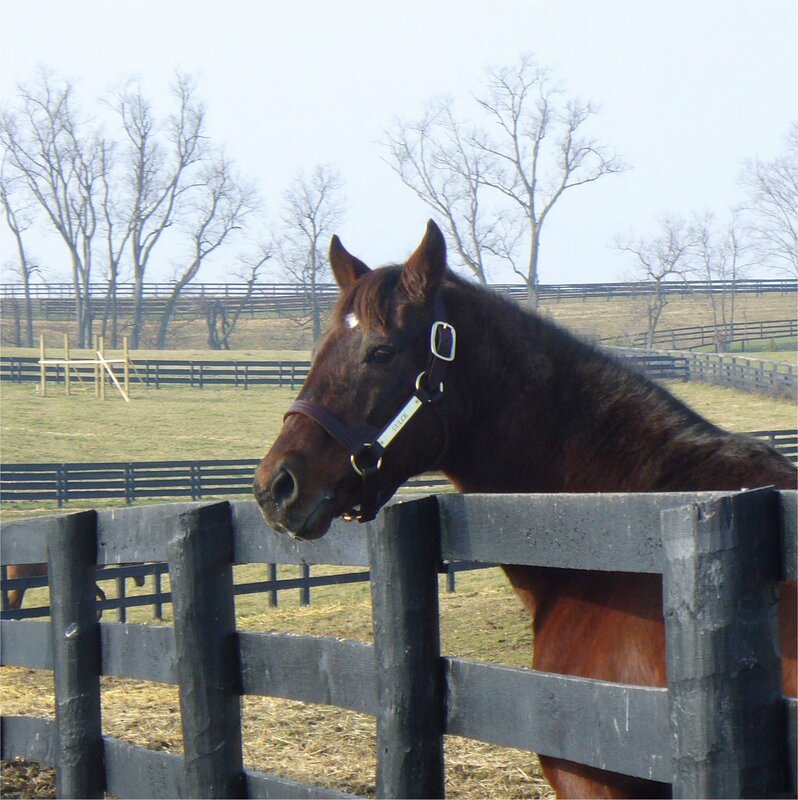 Foaled at Darby Dan Farm in Lexington, Roberto was by Hail to Reason out of Bramalea (by Nashua). Roberto crossed the Atlantic to compete successfully against the Irish and English at their own game on the grass, a feat not accomplished by many American horses in his day. At 2 he won the Anglesey Stakes and National Stakes in Ireland, earning the title of Champion 2 year old in Ireland. At 3 he won the Epsom Derby and Benson & Hedges Gold Cup in England, came in 2nd in the English Two Thousand Guineas, and won the Vauxhall Trial in Ireland. At 4 he won the Coronation Cup in England. Returning home, Roberto stood at Darby Dan. 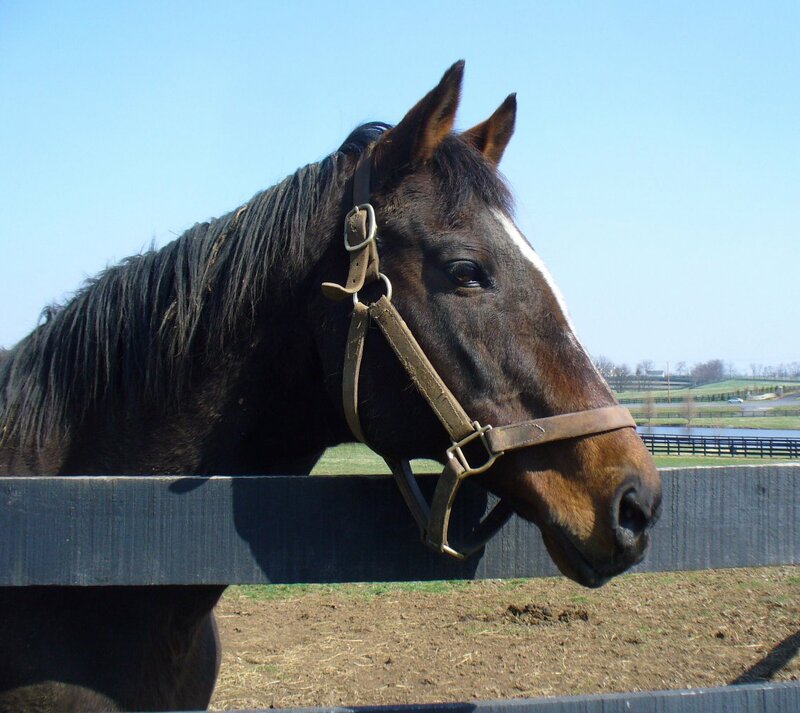 He sired 6 champions, among them Sunshine Forever, and top turf sires Dynaformer and Kris S.
Roberto’s influence on contemporary grass runners would be hard to overestimate. And Old Friends’ population of turf achievers fully reflects it. 1988 Eclipse Turf Champion Sunshine Forever comes first to mind. Sunshine looks very much like his sire Roberto. 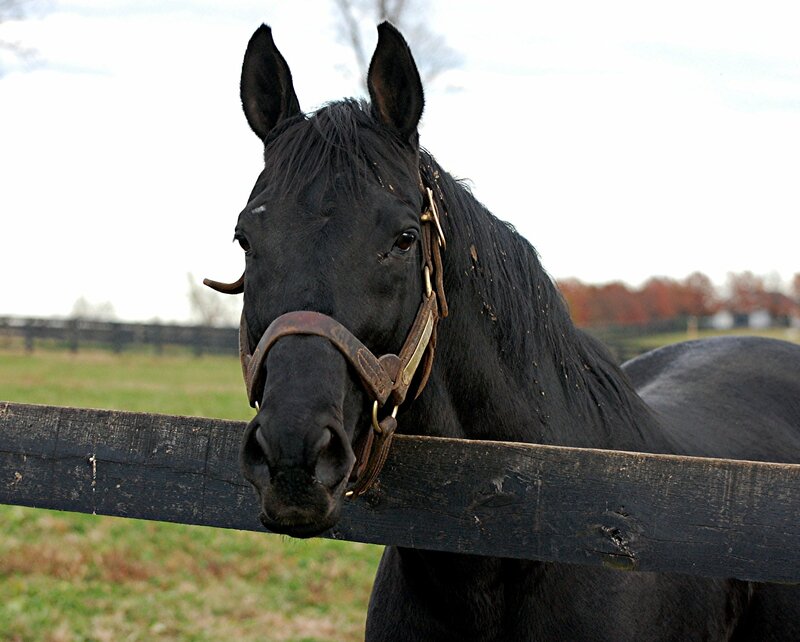 Sunshine was one of the soundest stakes winners of modern times, winning Grade 1 stamina races every two weeks for six weeks as a three year old, something the sturdy old time horses used to do, but a rare feat in his time or since. You can see it, too, in his legs, strong and straight with wonderful bone mass. In his decade at Old Friends, Sunshine has also proved the proverbial “healthy as a horse” (except for that one time in 2004 when he colicked and so Michael didn’t go to the Kentucky Derby with the owners of a horse named Giacomo…if asked whether he really just wanted his best buddy all to himself that day, I wonder whether Sunshine would nod his head?). 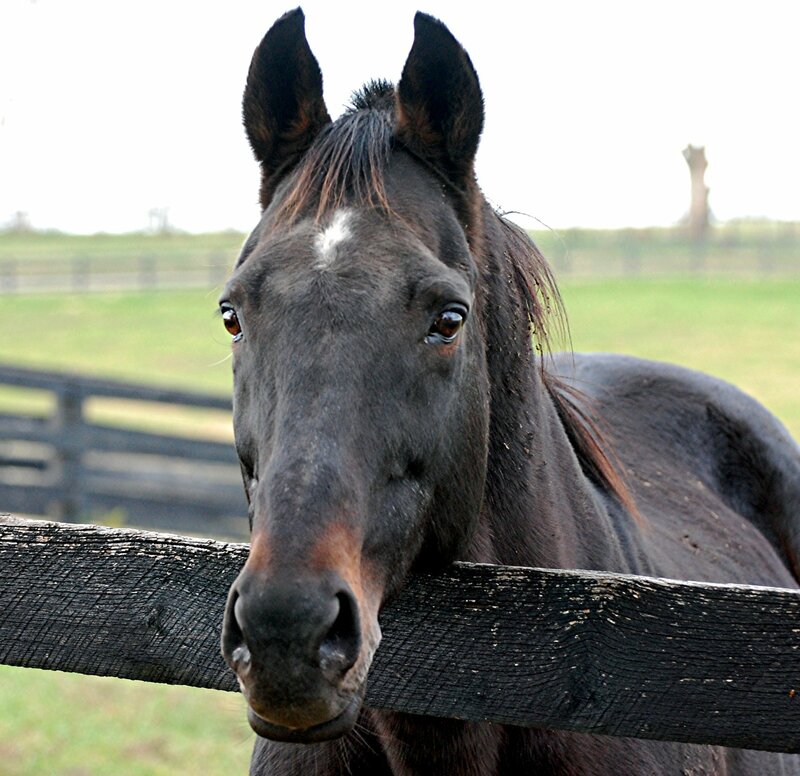 In the paddock next to Sunshine Forever is Prized, winner of the 1989 Breeders’ Cup Turf. He’s by Roberto’s son Kris S (so he’s Sunshine’s nephew, though equine family relationships are usually reckoned through the mother). Prized’s conformation may not be as flawlessly “correct” as Sunshine’s, but his long, strong legs took gigantic strides and his powerful frame made him a formidable athlete. Prized passed his athleticism to his son Brass Hat. He’s also the damsire (maternal grandfather) of Paddy O’Prado who hopefully will hand down that heritage at stud at Spendthrift Farm just down the road. But they’re not the only ones in that corner of Dream Chase Farm who remind racing fans of Roberto’s greatness. 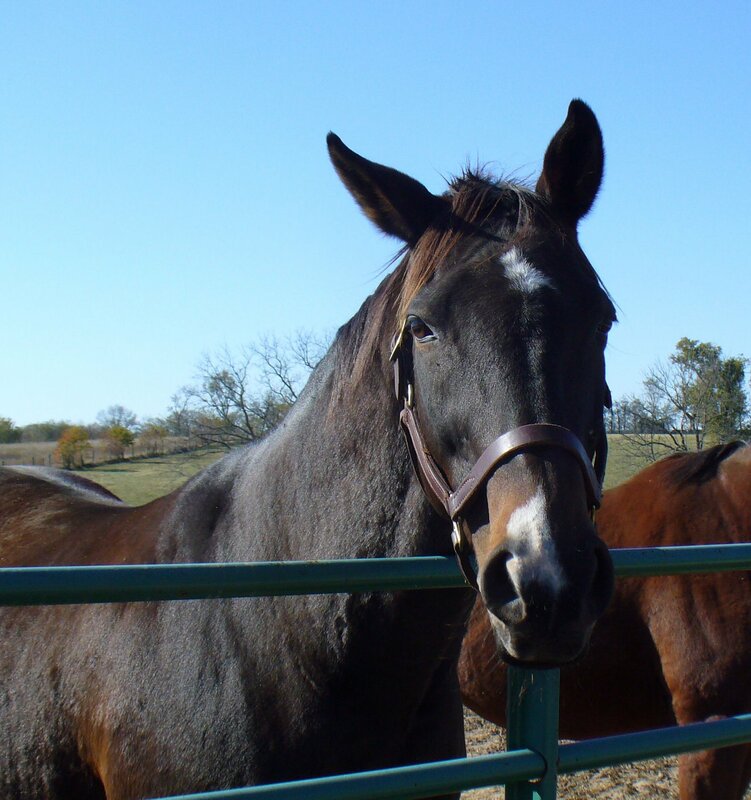 Across the run from Prized and diagonally from Sunshine Forever lives You and I. He’s also by Roberto’s son Kris S, though a more modern looking, refined horse. You and I won the Cowdin Stakes at 2, the Riva Ridge Stakes at 3 and at 4 the prestigious Metropolitan Mile and the Brooklyn Handicap. He beat some of the best of his time, including future Derby winner Go For Gin, Our Emblem, End Sweep, and Key Contender. And of course he passed his fleetness to his spectacular daughter You. Roberto’s heritage is also shared through Kris S by Kudos (whose damsire was Damascus—I’ll talk about Damascus another time). Racing for Jerry and Ann Moss, Kudos won the Grade 1 Oaklawn Stakes, the Grade 2 Californian Stakes and others. Like Prized and You And I, Kudos prevailed in stakes on both dirt and turf and won upwards of a million dollars. Speaking of champions on surfaces besides the grass, Roberto contributed to the talent of some of the most highly regarded dirt and synthetic surface champions of more recent times, notably Zenyatta whose dam Vertigineux is his granddaughter (she, too, is by Kris S), and Barbaro whose sire Dynaformer was one of Roberto’s most successful sons at stud. 5-time Breeders’ Cup Steeplechase winner McDynamo is another son of Dynaformer.